batam activity: Batam Haute Couture Fashion 2010, Models R'Luxs Existence "
Batam Haute Couture Fashion 2010, Models R'Luxs Existence "
A total of 50 models featured in R'Luxs Models Agency lively third anniversary on Sunday (20/06/2010) in the atrium of the Nagoya Hill. The celebration, titled Spectacular 3rd Anniversary Models R'Luxs This model also invited parents who nurtured by Ronald Moreno, as the owner of R'Luxs Models. Not only that, hundreds of visitors Nagoya Hill shopping mall seemed enthusiastic in watching fashion show that displayed by these models. The event began at 19:00 pm, opened by the appearance of six performances that brought dancers from Jakarta Indonesian archipelago with the traditional dance music that has digubah.Selain wearing blue costumes, the dancers also wear a mask when he brought his dance. While women dancers dressed in pink is not to be outdone, wore ornaments dikepala la Balinese dancers. Ronal Moreno, as the owner of Models R'Luxs states, this event takes the concept of haute couture Batam Of Fashion 2010. "This is one of uniqueness, this concept has not previously exist in of Indonesia. Usually only available in Europe, and now I will show in Batam, "he said on the sidelines of a fashion show of his work. It is also evident from the results of Ronal Moreno own design that was exhibited by the model. The first session of care model R'Luxs Models glided with the dress waved Unsurprisingly, the concept of haute couture designs such as this seems to adopt a well-known works of Adi's Clothing Oscar de la Renta, with an average material satin and waving, create clothing designs that appear impressed graceful , but ideas like this are not exactly the first fully biased, it's just probably a combination series of events arranged in such a beautifully made Ronal claims as the first. Ronal explained that the celebration of the third anniversary is a celebration terakbar ever made by R'Luxs Models. "This anniversary year of the first Model R'Luxs made great, by displaying all the talent R'Lux Models and design of my dress collection, usually we have only just entered the Private Party to celebrate the anniversary R'Luxs Models, now we are grateful R'Luxs Models already known by the community as a Model Agency who was talent-talent specialist accommodate the modeling world, "said Ronal added. In celebration of the Anniversary of the third R'Luxs This model is also attended by Head of Batam City Tourism Office, Guntur Sakti. 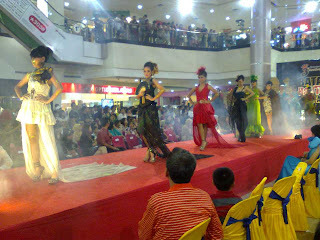 He said that personally he would like to thank R'Luxs model have participated Visit Batam make the program successful in 2010, through the fashion show, which is expected to be a trend for the year 2010. "Thank you for organizing the event Pemko Batam Of Houte Couture Fashion was held at the Nagoya Hill Mall, it is also expected to be a trigger for other agencies in Batam to hold fashion show in a public spot," said Thunder.